Blended training enables you to get the best of online training, yet not lose out on the impact of human interaction. In this article, I share tips and best practices that you can use to create highly effective blended training programs. What Is The Blended Training Approach? Put simply, blended training (or hybrid training) combines the usage of face-to-face, Instructor-Led Training (ILT) with online training (that is, eLearning or mLearning). 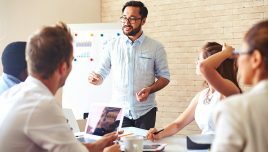 The blended training approach offers the best of both formats and you can “blend” them to create a high-impact corporate training. Furthermore, it provides tremendous flexibility on how you can combine both ILT and online components in a manner that serves your learning mandate most effectively. It is learner-centric and allows them a higher degree of control on how they can learn and at the pace they want to learn. 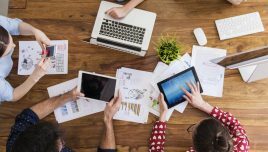 From an organization’s perspective, the blended training approach enables them to reach a wider audience in a shorter time. It also enables them to cut costs, yet provide a higher engagement and accessibility for the learners. Are There Any Specific Models That Can Be Used To Determine How To Offer Blended Training? 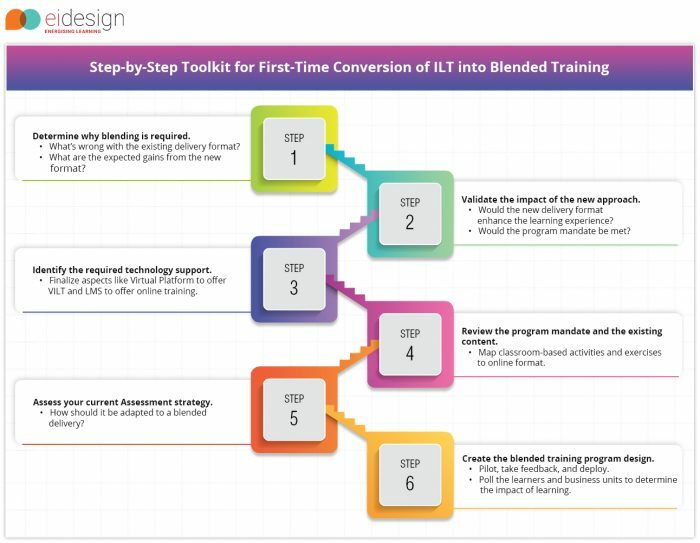 While blended training has its significant advantages, a lot depends on the approach that you use to “blend” the face-to-face or ILT components with online training (eLearning or mLearning). Model 1: Significant face-to-face, ILT training and a small component of online training. Model 2: An even mix of face-to-face, ILT training and online training. Model 3: Significant online learning with short and focused face-to-face, ILT training. How Can You Determine What Degree Of Blending Would Be Most Effective? As I see it, effective blending is both art and science. Let me share some of the techniques we have been using. I share a Step-by-Step Toolkit that is particularly useful when you are looking at first-time conversion of an ILT program to a blended approach. Are there any existing challenges in the existing delivery that must be offset in the new format? What are the expected gains from the new format? Would the learners align to the new delivery format and get an enhanced value? Would the program mandate be met? Virtual Platform to offer VILT. LMS to offer online training. Besides identifying the goals, the approach (the degree of blending), the technology, and the desired impact, you also need to do an effective mapping of classroom-based activities and exercises to online format. You also assess the current Assessment strategy and how it should be adapted to a blended delivery. Create the blended training program design. Create an approach plan to implement it: Pilot, take feedback, and deploy. Feedback and further improvement: After a suitable time, poll the learners and business units to determine its impact. Based on this feedback, determine if we need to recalibrate the previous blend. Are There Any Best Practices That Can Be Used To Increase The Impact Of Blended Training? 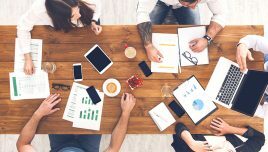 Establish learner roles and responsibilities: As is true for a transition or transformation, there should be clarity on how learners and the organization would be able to leverage the blended training. Provide clear instructions and communication for the program. Create an effective support system for the learners as well as the corporate trainers. The blended training goals need to be identified in advance, and these should also reflect the intended gains expected from blended training. The goals should be SMART (that is, Specific, Measurable, Achievable, Realistic, and Time bound). Start small, but factor for its scaling. Identify the right project and identify the right team to manage. Early success matters and provides crucial feedback to improve in future. Select a project that adapts more easily to a blended training model and can demonstrate clear gains. Have a dedicated team to monitor and manage. Use the ongoing tracking and checkpointing to gather feedback for further improvement. 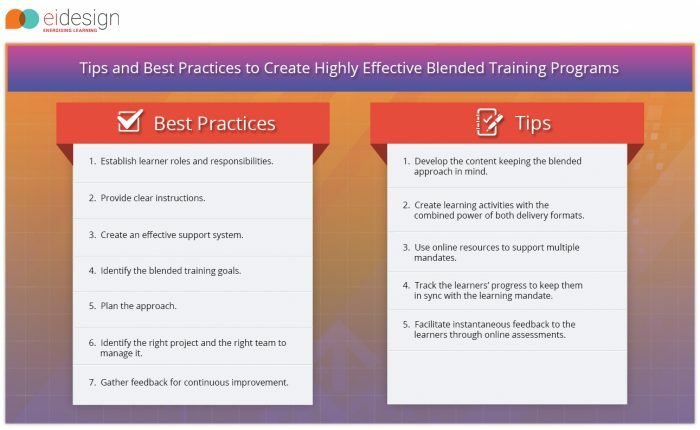 What Are The Tips That You Can Use To Create Highly Effective Blended Training Programs? Develop content in a manner that allows you to calibrate the mix of blending easily. This is vital for you to process the feedback and keep stepping up the impact of your blended training program. Create learning activities that leverage on the power of both delivery formats. For instance, a role play (in a workshop) can be supplemented with online branching scenarios. This blending enables you to reinforce the learning and check how the learner is able to apply the primary learning in different contexts. Use the online resources to support multiple mandates. You can use them to prep the learners before a workshop. You can also provide these as online reference materials that they can use post the workshop and on the job. The blended delivery facilitates keeping track of learner progress far more easily than ILT training. By the same token, it also enables you to share feedback with equal ease. Use these two aspects to keep the learners in sync with the learning mandate. Online assessments provide you with an approach with which you can test and share feedback instantaneously. You can randomize the questions, have different set of questions for different profiles, and decide which ones should be formative/summative. As I had mentioned earlier in this article, crafting the right blended training program design is both art and science. I hope the toolkit, the tips, and the best practices outlined here provide you the required ammunition to create highly effective blended training program designs. Check out our award-winning solutions and approaches to enhance the impact of your corporate training by booking a free demo/consultation, or you can write to me directly at apandey@eidesign.net.